Senior Money Management | Full Circle Home Care Inc.
Is your loved one beginning to have difficulty managing all the paperwork and day to day financial affairs? Are you concerned that this may leave him or her vulnerable? Does it seem difficult to find the time to sort through all the bills and organize your files as you would like to do? Paying bills is stressful enough, even for those that are young and able. As day-to-day bills acquire-and as more bills pop up due to elder care, seniors might find that they require bill paying services to help make payments, sort bills and prioritize payments so that no important bills get swept under the rug. 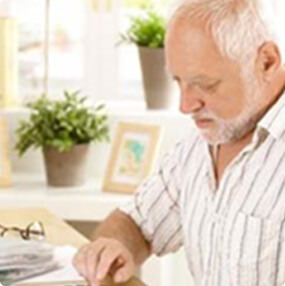 Using a bill paying service can ease quite a bit of stress for seniors and their loved ones. Bills build up fast, and they come at all different times of the month. Seniors that struggle to maintain the tasks that once were easy for them in the past, may find it hard or confusing to keep up. Count on a quality bill paying service to ease minds and eliminate financial troubles. As people age and change, so do their lifestyles and budgets. Often Seniors or their families find they require assistance, or would like to delegate financial management to a qualified and trusted associate. In many instances, when elders need help managing money, adult children or relatives step in. Yet often adult children live far away or have busy lives that make daily, hands-on money management difficult or impossible. This is where Full Circle Integrated Home Care can help. Full Circle Home Care offers a daily money management program to provide personal financial assistance to older Canadians who can no longer, or do not want to handle certain aspects of money management. Whether a senior needs comprehensive help or just a monthly reminder to pay bills, we can design a program to meet your specific needs and budget. Our focus is to help Seniors maintain their quality of life, their way. 1. Professionally managed bill payment services based on subscription. No need to worry about missed or late payments resulting in utility cut off, late fees, or credit rating damage. 2. Personal and professional services for managing the financial independence of the elderly, the disabled, and their care givers. We recognize that sometimes a little help is needed to help an individual maintain their independence yet keep their financial affairs in order. 3. Convenient — Streamlined, secure, and well organized sign up process. We pride ourselves in keeping all of the activities with Full Circle Home Care’s services easy to understand and use. 4. Professional management — We utilize proven technologies and industry relationships. We partner with only the best in the industry to provide safe, secure services that will be here for you today, and tomorrow! 5. Information is accessible to subscribers via a toll free customer service number during normal business hours and via the internet 24 hours a day, 7 days a week through industry leading secure web access. Please Note: Full Circle Home Care does not take the place of professionals in the accounting, investment or social service fields. Rather, our work complements the work of other professionals by facilitating the completion of the day-to-day tasks. If requested, we can provide our clients referrals to professionals.